That said, in virtually all cases, you will need more than one treatment to achieve optimal results. Incremental procedures enable us to enhance your ultimate results while ensuring safety, comfort, and convenient scheduling. There are several different types of laser skin treatment tools and even more different types of skin conditions we use lasers to treat. Plus, every patient is unique in their own way. So, as we always like to say, your results may vary. Besides, exciting as it is to start seeing results soon, what you really want to know is how long it will be before you see your final results. And that’s where we tend to see the differences among lasers and procedures and people. While one patient may require two or three treatment sessions, another person may require 6 or 7 to reach their optimal results. Why Do We Love Lasers So Much? Lasers are very precise. Depending on your goals, we can target tiny areas such as earlobes and toes, all or part of your face, or virtually any other part of your body. Lasers are fast. We can treat a very small area in a few seconds, or treat your entire back in under an hour. Lasers don’t hurt. Again depending on the particular procedure, most patients say they feel mild discomfort, sort of a “snapping” sensation. Lasers are a lunch-hour favorite. Not only are treatment appointments short, there is no downtime afterward. You can zip in, get a treatment, and get back to work, the gym, whatever your day involves. However, due to the way lasers work, men and women with darker skin may not be good candidates for some of these procedures. This is less of an issue than it was a few years ago, thanks to advances in laser technology, but it points up the importance of scheduling a personal consultation before making any decisions about laser skin treatment. Laser skin procedures are not spa treatments. Whatever the treatment procedure you choose, you’re anticipating smoother, healthier, rejuvenated skin. Not burns or other skin damage. Lasers use highly targeted heat or very intense light to perform their “magic,” and they can be dangerous unless the person performing your treatment has adequate training and experience. Here at Rocky Mountain Laser Aesthetics, your safety and comfort are our primary concerns. 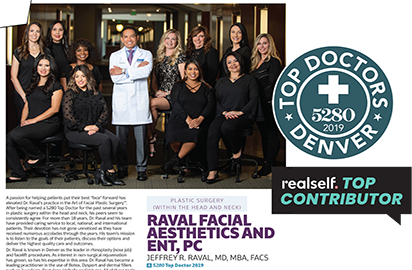 Dr. Jeffrey Raval, MD, MBA, FACS and our team of paramedical aestheticians are highly skilled in performing the laser treatments we offer. Our clinic meets the highest standards for sanitation, and in-office surroundings offer the ultimate on comfort and friendliness, too.